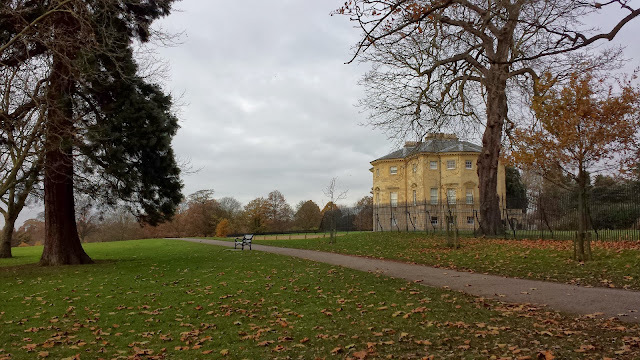 Danson House, which is the Georgian mansion at the centre of the park and was constructed c.1766. Throughout the 20th century the house was largely uninhabited and fell into a dangerous state of disrepair. It was acquired by English Heritage in 1995 and painstakingly restored over the next 10 years. In 2005 it was reopened by HM The Queen. The Lake, which covers 7.8 hectares. That means that it covers 10% of the total area of the park - that's a nice round number - I wonder if that is intentional. 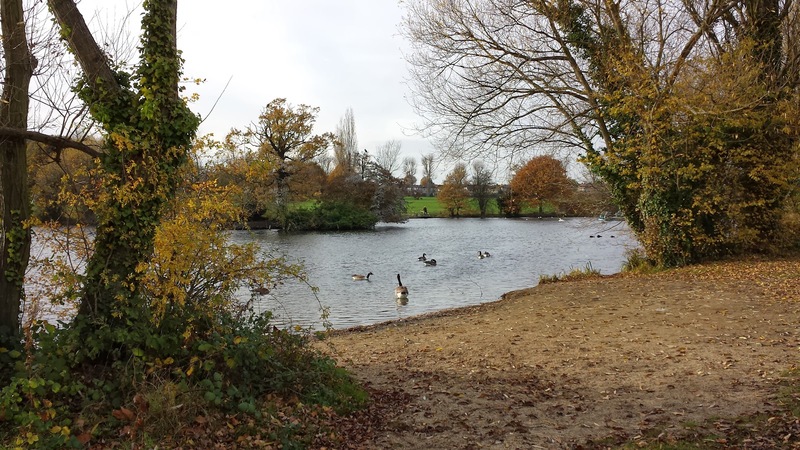 Apart from being extremely picturesque, it is also used by the Danson Park Watersports Centre for their activities. The park also features tennis courts, a couple of bowls greens, a trim trail, a bog garden nature reserve, various formal gardens, a few cafes and restaurants, and a really good playground. It also hosts the Danson Festival every summer which consists of a funfair, various arts and crafts stalls, and musical performances by local artists and is usually headlined by a x-factor-type pop star. It also hosts a large fireworks display in November. The car park and bicycle racks are located at the top of the park, quite close to Danson House. 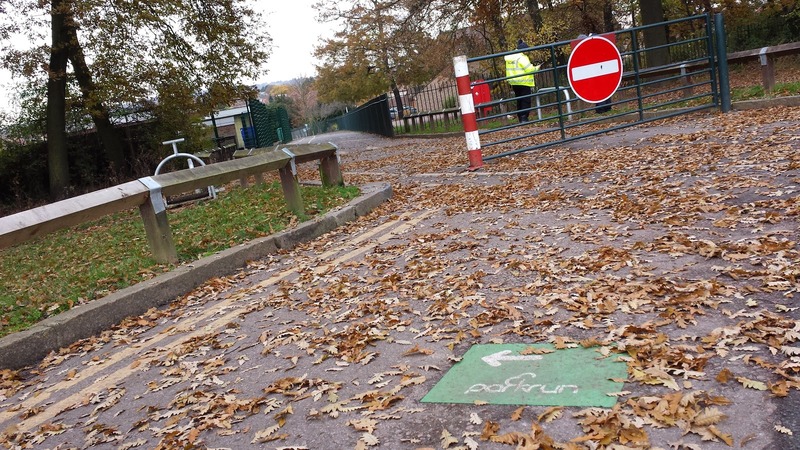 However, most cycling parkrunners will be able to use the fence by the start/finish area to secure their bikes during the run. From what I can see on the Bexley website, parking is £1.50 at weekends and on bank holidays from April to September but free at all other times. For those travelling by public transport, there are buses (the 96, 89, 422, and B1) that run past the park. 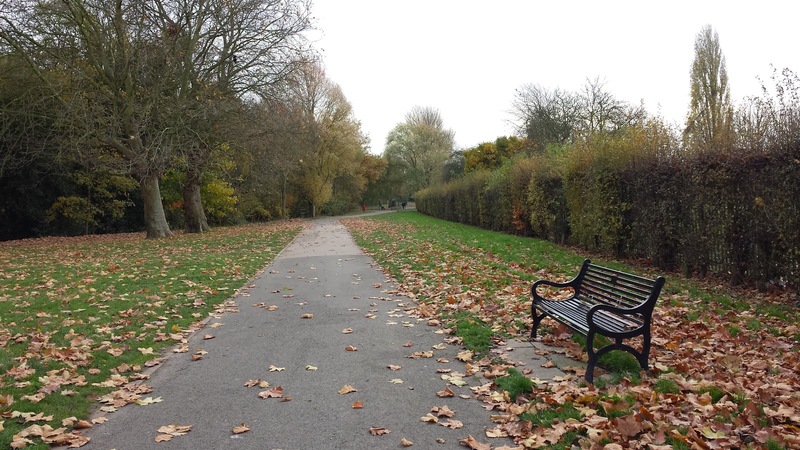 If you're using a mainline train, you'll be heading for either Welling or Bexleyheath stations - Neither is that close to the park so leave plenty of walking/jogging/waiting for a bus time. 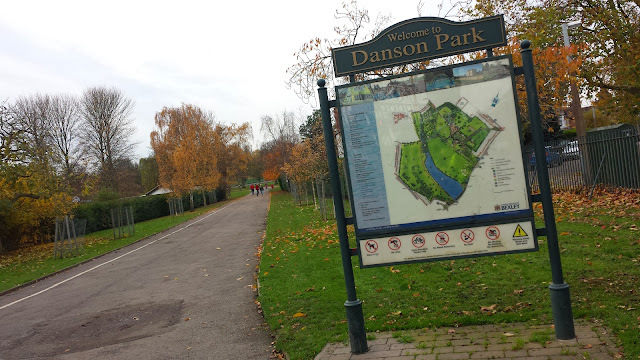 The parkrun start/finish area is directly opposite Danson House, but on the southern side of the lake. So if you have parked in the car park make sure you leave time to walk down the slope and around to the other side of the lake. If need to visit the toilets beforehand, there are two toilet blocks in the park - some at the main car park and some adjacent to Danson House. 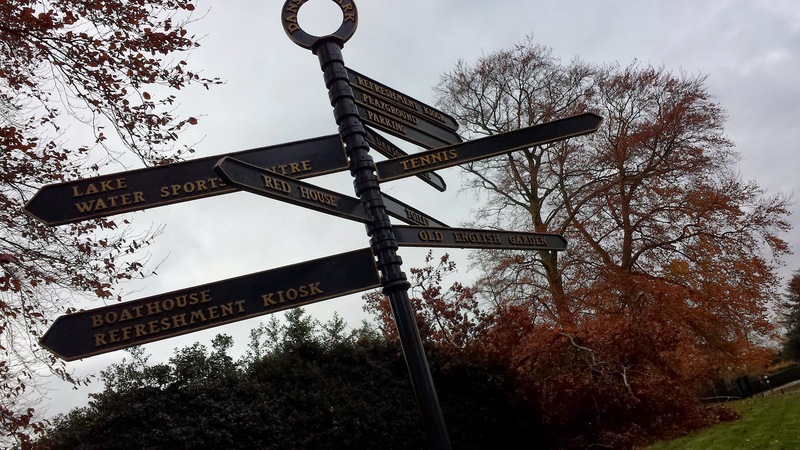 They are clearly marked on the park maps which you'll find dotted around the park. 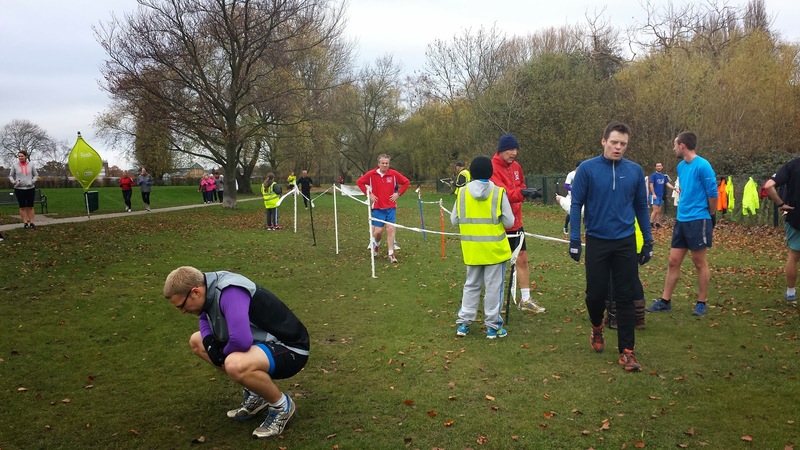 It is a two lap course with a couple of minor inclines and is run in an anti-clockwise direction. 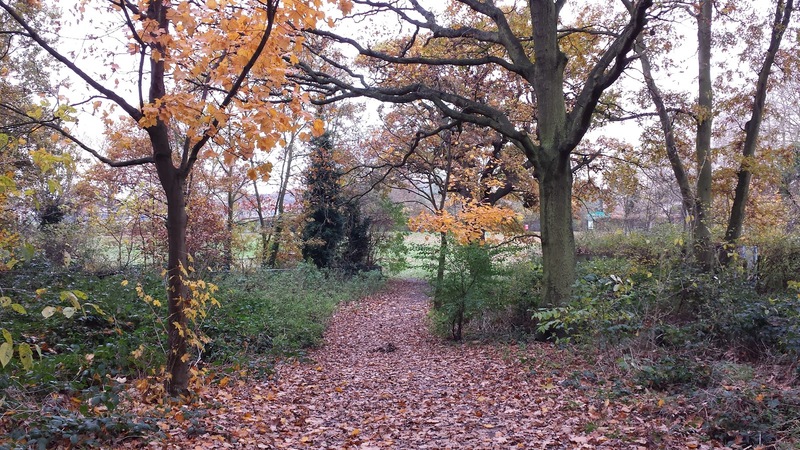 It is mostly on tarmac paths, but there are sections on a woodland path, gravel and grass. In the winter, trail shoes are a good choice as there are places that get muddy. From the air, I think the course looks a little bit like a whale. 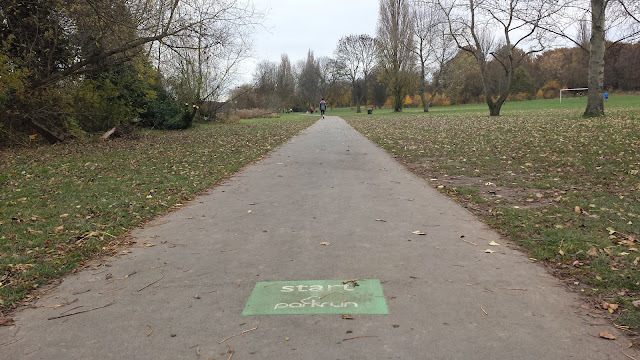 Oh, and to show just how important the run has become to the park and local community, they have recently had some permanent course markers installed! Just before the start of the run, the event director, Mel, spotted that I wasn't a regular and came over to say hello. With so many people to talk to etc, it was very nice of him to make the effort to make me feel welcome - thank you. Starting adjacent to the lake, runners head east with the lake on their left. Upon reaching the end of the lake, the course takes the natural path around the eastern border of the lake. 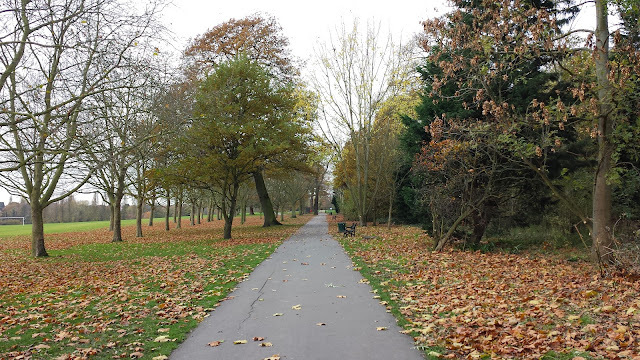 This path rises slightly as runners progress, it's very gentle and is the longer of the two inclines. Continuing on this path and leaving the lake behind, the runners carry on past the boathouse, where the incline continues with a crossing of a marshalled access road. At the end of this path there is another left-hand turn into the tree-lined 'Diana Avenue' which leads towards the house. 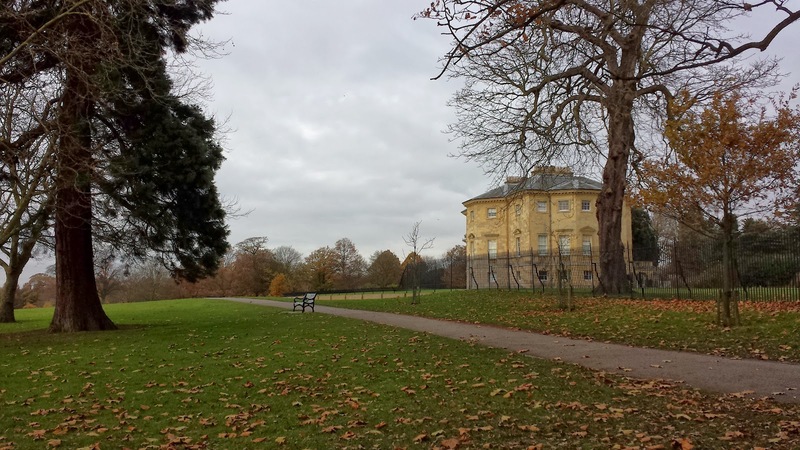 It then offers up a quick left-right which leads onto the path (pictured with the house at the top of this post) that runs right past the front of Danson House. At this point, runners have a lovely view back across the lake. While glancing back down towards the lake it's worth noting the magnificent 200 year old Oak Tree which stands alone in the middle of the grass between the house and lake - It is the Bexley Charter Oak and is this very tree that features on the borough's coat of arms. 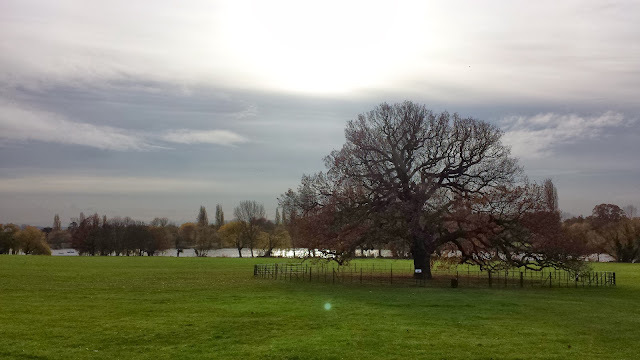 The fence and logs have been placed around the tree to protect its delicate root structure. From here, runners continue on the path, which drops ever-so-slightly downhill, until reaching a private access road. 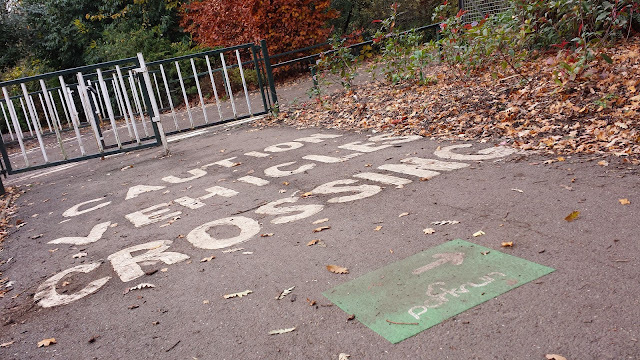 Here they have to do a quick shimmy through a fence and immediately turn right to run on the gravel path up the steeper of the two inclines, which leads towards the main car parking areas and playground. Runners have to work their way around a wooden gate just before reaching the top. There is a double left hand turn at the top. Firstly turning onto the cycle lane and past the 'no entry' gate and then left through the second gap in the wooden fence (there was a marshal and another permanent parkrun arrow to show which one) which takes you into the woodland section. This part is downhill, and further down has some very low, spaced out wooden steps to negotiate. I say steps, but they're not really steps, they are merely fairly thin logs that run across the path - I imagine to give a flatter walking surface, but you do have to keep an eye out for them - which I found didn't allow me to take full advantage of the downhill stretch. 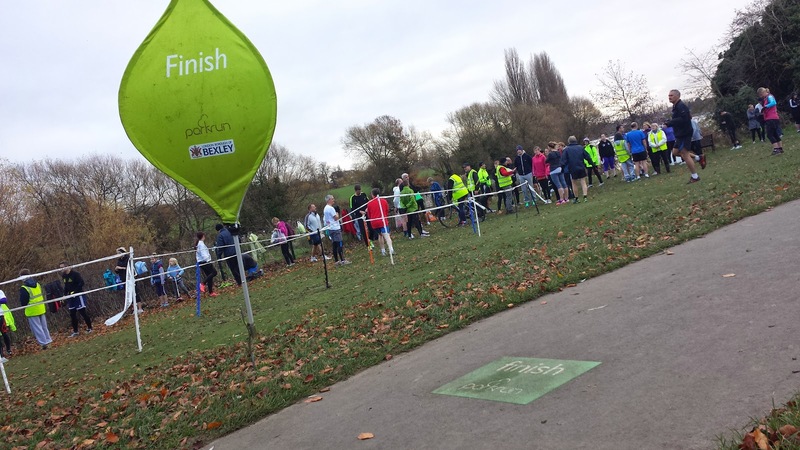 Once at the bottom, runners bare slightly left and run diagonally across the grass aiming for a point between the tree and a green bin before joining the path. I found myself split from the four runners in front of me at this stage and didn't have anyone to follow (however, there were cones on the grass), so I would recommend having a look at this section before the start of the run just so you know what to expect. From here it is a case of simply following the path and passing through the gate until reaching the start/finish area. Lap two is identical with the finish funnel just off the main path as you return to the start/finish area. 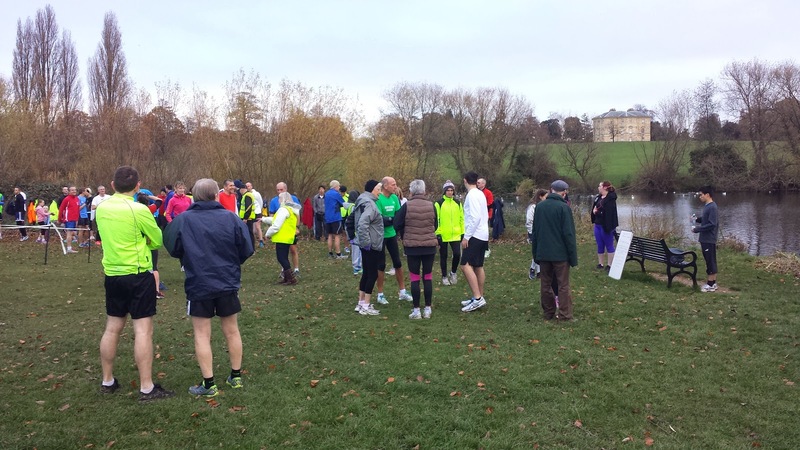 It's another great venue for parkrun and I really enjoyed the course. The only downside for me was the large number of dogs I encountered around the course. Some people are not bothered by them but I feel very uncomfortable running near them, and even more so when they are unleashed (which they all were). There were a few occasions where I slowed down to the point that I was almost walking and even then I still felt very nervous. 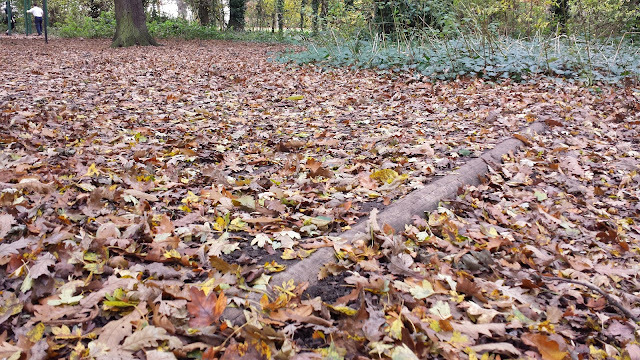 Buggy runners - You could run this course with a buggy but you will have to watch out for the steps/logs during the downhill section in the woods. It will be a tad bumpy for the occupant, especially towards the bottom, but if they are anything like my daughter they will love it! 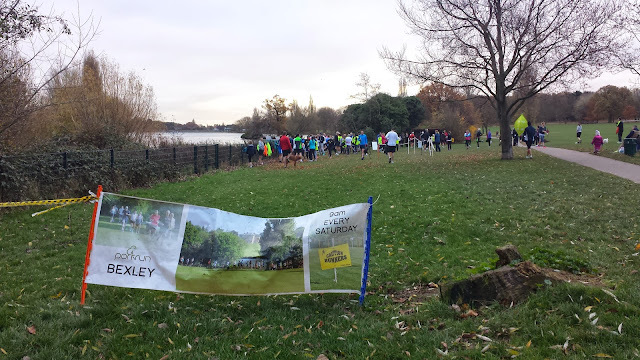 So that was Bexley parkrun. Quite a significant one for me as it marks the completion of the current set of London parkruns (and the London+ set, which I've labelled as such to cover all those within the M25 including the ones that are not technically in London). And if you listened to the parkrun show episode 116, you will have heard the term 'regionnaire' was born (if not, have a listen), which is the name given to someone that has run at all of the parkrun venues in one particular region. I think it means that I am allowed to call myself a London (or even a London+) regionnaire.